The upright row is considered one of the best muscle builders for the back and shoulders, but it is also regarded as potentially dangerous for the shoulders. This is a lift that requires perfect form for the best results and to avoid injury. It is generally only performed by bodybuilders. The upright row exercises the front and middle heads of the deltoids, as well as the trapezius, rhomboids, and even the biceps muscles. It is very good at growing these muscles. However, these muscles can be effectively developed with safer exercises, such as the bench press, overhead press, and pushups. The primary use of this exercise is by bodybuilders who are targeting specific muscles and are using perfect form. Using a barbell, the "wavy" EZ curl bar makes this exercise a little easier on the wrist joints. Stand with legs at a comfortable distance apart—shoulder-width is about right. Grasp a barbell or dumbbells and allow it to hang in front of you at the length of your arms. Your palms should be facing your body. Standing up straight, adjust your grip so that your hands are about in line with the thighs. Shoulder-width apart (no closer) is recommended for wrist and shoulder safety. Breathe in and brace the abdominals, keep the back straight, chest up, and eyes focused forward. Lift the barbell straight up toward the chin, leading with the elbows and keeping the bar close to the body. Breathe out during the effort. Your arms should go no higher than parallel with the shoulders. Slightly less is OK. Pause at the top of the lift. Return the barbell back to the starting position, breathing in as you lower it. Repeat the move for your defined number of repetitions. Avoid these errors so you get the most from this exercise and avoid strain or injury. While lifting, keep your elbows above the level of your forearms. Don't raise the arms above parallel to avoid shoulder impingement. This exercise can strain the wrists, so use only a wide grip (shoulder-width). Keep your wrists supple during the lift, allowing them to flex as needed. Try to keep the wrists from moving down or to the side during the lift. Keep the torso stationary and your abs braced throughout the lift, no turning or twisting. Keep your back straight, with the chest up and eyes focused ahead. Do not squat down and up after the initial pose. No movement in the legs should occur. Do not lift heavy with this exercise unless you are experienced and trust your shoulder joints. Shoulder impingement has been reported with excessive weight or poor form. The shoulder joint is a very complex mechanism and injuries to it can severely impact your exercise goals and can be slow to heal. This exercise can be adjusted to make it more accessible to the beginner and to increase the effort needed as you build strength. 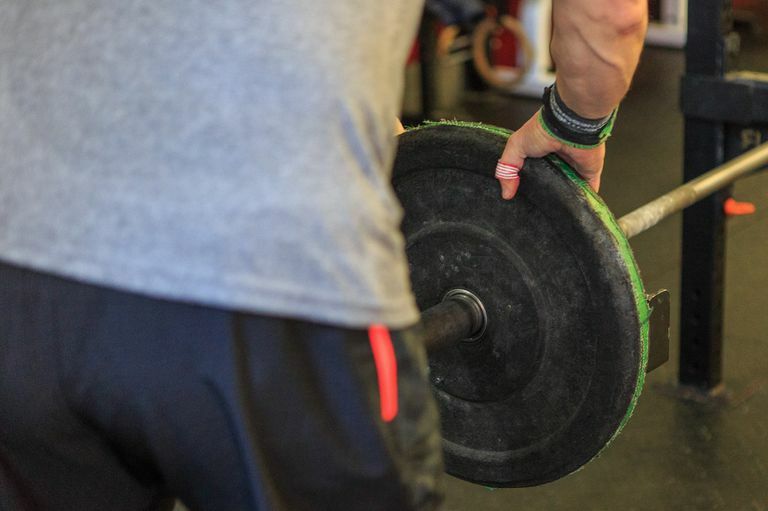 Using a barbell is best as you develop your technique. Other options include dumbbells or a cable pulley machine. Look for an EZ-curl bar that allows you to grip the barbell at slight angles to help reduce the strain on the wrists from the angle at the top of the lift. If you're new to the upright row, start with a barbell with no weight. This will give you a chance to experience the lift, learning the movement and the positioning throughout. Add weight gradually, and don't add too much weight before your shoulders are ready. Increase the weight lifted cautiously. It is generally recommended that you switch to other exercises to develop these muscles. Use dumbbells only if you know how to do this exercise correctly. The dumbbell lateral raise in a slightly bent-over position is preferred. The American College of Sports Medicine and the National Federation of Professional Trainers both say this exercise should be avoided by people of all levels of fitness. If you choose to use it, be sure you are being coached to use perfect posture and form. Whenever working the shoulder area muscles, care must be taken to avoid injuring the shoulders. Avoid heavy weights with this exercise. If pain or inflammation occurs, cease the exercise.